Increasingly, homeowners are coming to understand the financial and environmental benefits of integrating renewable energy technologies within their homes. Backed by many years of residential and commercial solar system design and installations throughout Africa and a huge range of innovative and well-tested products, Specialized Solar Systems is a leader in solar energy solutions industry and can confidently offer residential homeowner’s the added security and peace of mind, that we will design and install a solar energy system to fulfil almost any energy requirement. An off-grid system is not connected to the electricity grid and requires battery storage. Off-grid solar systems should be designed correctly in order to generate enough power throughout the year and have the necessary battery capacity to meet the installed locations electrical energy requirements or demand. Below are hand-picked selections of our most popular, complete and proven residential off-grid solar systems with different sizing options by Specialized Solar Systems. This selection of off-grid solar systems will give our customers an overview of all the equipment used with explanations to help assist you with your off-grid solar energy generation planning. To view a more detailed overview please visit our off-grid solar systems catalog available over here. A Grid-interactive Hybrid Solar System intelligently gives you the best of both worlds. With the added convenience of a grid connected system including the ability to earn Feed-In-Tariff Credits (if your municipality allows) and the added security of a battery backup. This means that you should always have electricity, even during a power outage and bad patches of weather. Below are hand-picked selections of our most popular, complete and proven residential grid-interactive Hybrid Solar Systems with different sizing options by Specialized Solar Systems. 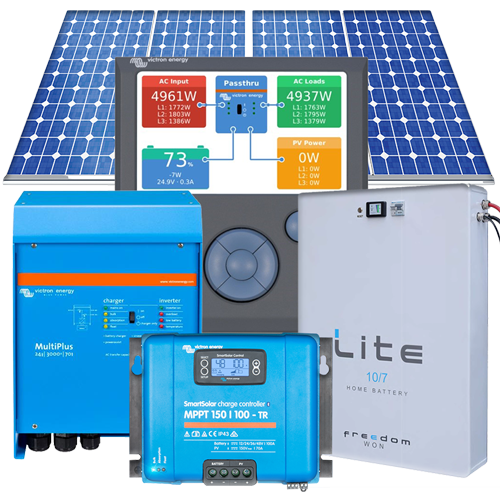 This selection of grid-interactive hybrid solar systems will give our customers an overview of all the equipment used with explanations to help assist you with your off-grid solar energy generation planning. 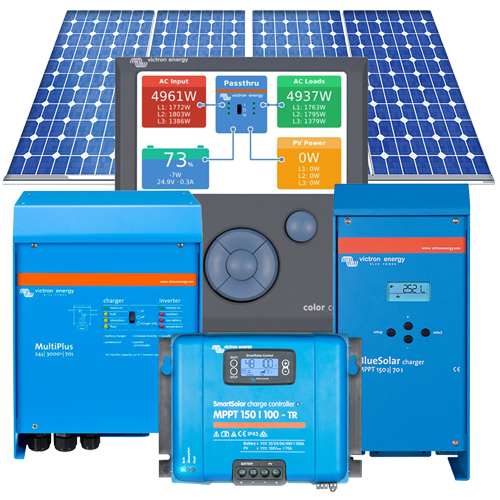 Specialized Solar Systems offers our residential, commercial and agricultural customers a large range of proven solar power inverters to fulfill your solar energy generation requirements. Solar power inverters come in many sizes from standard inverters to very advance solar energy management systems with remote access that enables a solar-energy-skilled technician to perform all sorts of functions to optimize your solar power/energy generation performance. To view a more detailed overview please visit our solar power inverter section in our product catalog available over here. Look for professionals who can offer you strong warranties, good after sales support and have a proven track record. Specialized Solar Systems - an established and reliable brand that you can trust. Detailed capitalization calculations that ensure you understand exactly how and when you can expect to break even, the structure of repayments and income and the overall profitability of your business. Detailed system designs upon acceptance.